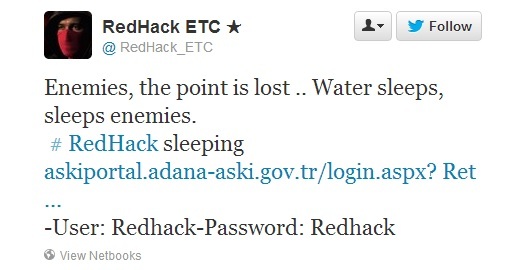 The Redhack hacking Group hacked into the websites of Istanbul Metropolitan Municipality, Water and Sewerage Administration. Hacker resets the credentials and announced the new login details on twitter i.e. "User: Redhack-Password: Redhack". Redhack (Kızıl Hackerlar, Kızıl Hackerlar Birliği), is a Turkish Marxist Leninist computer hacker group which was founded in 1997. It's a group of ten alleged members were arrested in 2012 and charged with cyber crimes that could garner 8 to 24 year prison term. The group's website alleges that all of the arrestees are innocent, and not in fact members.